Egg rolls are such a popular item at Chinese or restaurants! Skip the takeout and make homemade crunchy Airfryer or Ninja Foodi egg rolls today! Filled with pork and cabbage and air fried to perfection. The process of making egg rolls is a lot easier than you think. Don’t be intimidated on rolling the egg rolls, it’s easier than you think. After the first couple, you will get the hang of it, and have a snack or main dish to serve up. 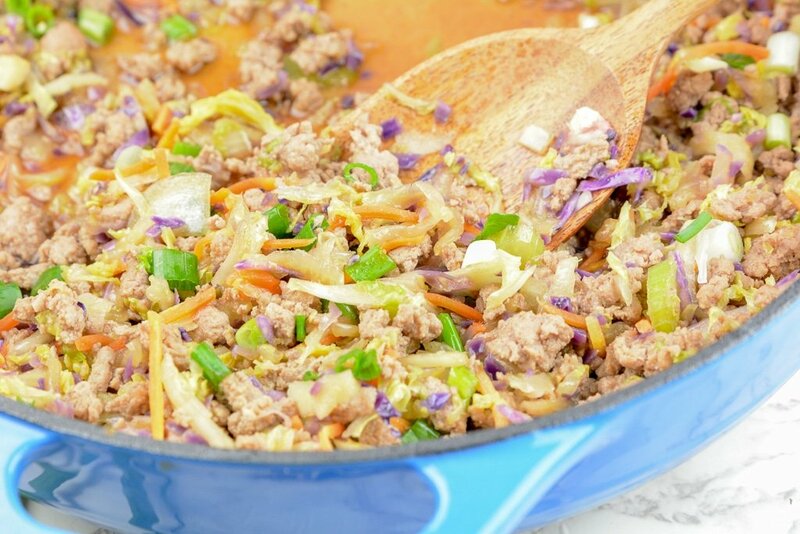 If you want a lower carb option, try my Egg roll in a bowl recipe! 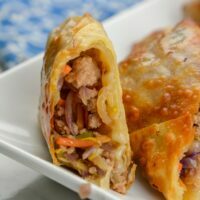 It’s outstanding and tastes just like the filling in a traditional egg roll! How do you get crunchy egg rolls without frying them in oil? 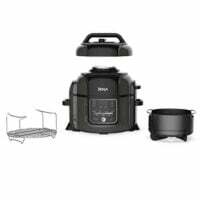 The Air Fryer and Ninja Foodi brother offer an air crisping component. It supplies high heat that circulates which helps crisp up all directions of the food in the basket. It will give you that deep fried texture with using little to no oil! If you don’t own a Ninja or Air Fryer I suggest looking into getting one. Both are really amazing appliances to have on hand. The Ninja Foodi also offers an electrical pressure component as well so it’s like two appliances in one. The concept of rolling up food is the same between an eggroll and spring roll but the other components are different. Spring rolls have a translucent wrapper, that is served cold. 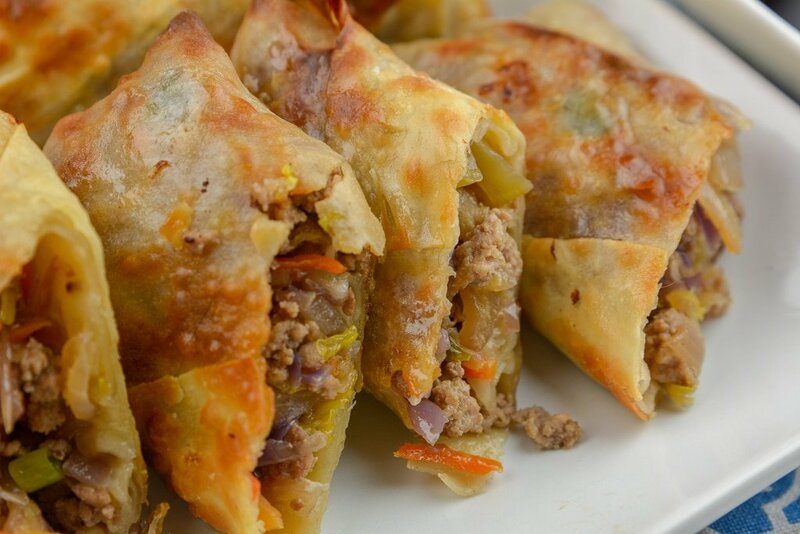 Egg Rolls have a thicker wrapper and are baked or fried. 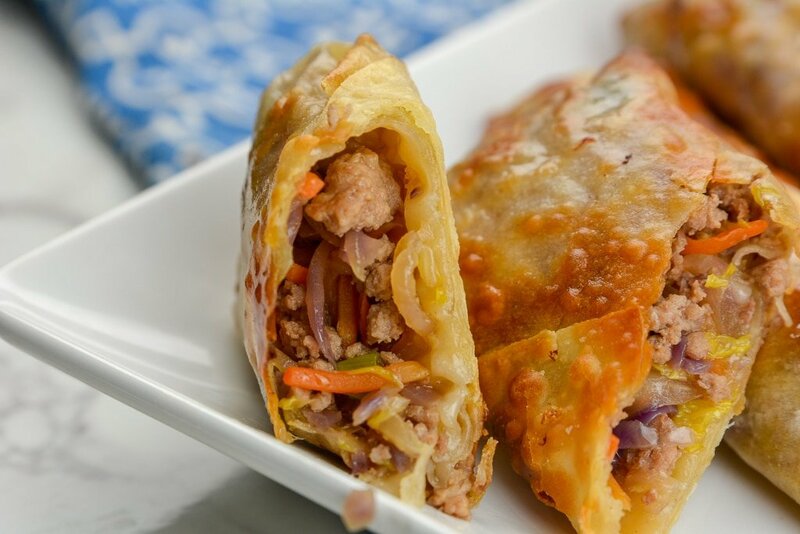 Egg Rolls are so versatile and you can find Egg Rolls with shrimp, chicken, pork, and more. 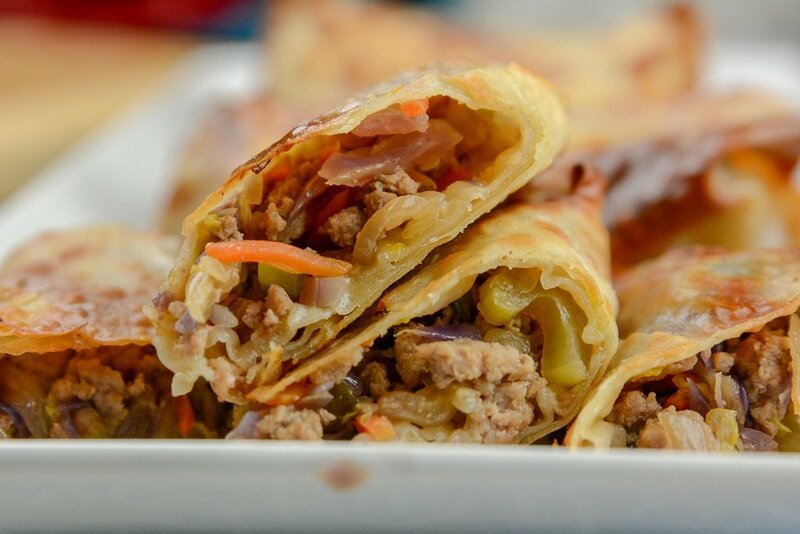 Generally, all Egg Rolls that are traditional offer a cabbage base and mixed in the meat of choice. You can prep your Egg Rolls in advance. Just make sure to wrap tightly in a plastic wrap and keep them refrigerated until ready to cook. You can prep them 24 hours in advance. Then when ready start air frying them. You can freeze Egg Rolls and reheat at a later time. Simply let your Eggrolls cool down after you air fry them. Then wrap up your egg rolls in aluminum foil or even plastic wrap then place in a freezer bag. Or wrap and place in an airtight container. Preheat oven to 350 degrees and place Eggrolls on a baking sheet. Bake for around 8-10 minutes or until heated through. You can microwave your egg rolls bit you will lose a lot more of the crunchy component as they can get soggy. Whether you serve these up as an appetizer, main dish, or snack, they are delicious and super easy to make. We make a bunch and then freeze them for meals or snacks down the line! Give this recipe a try today and see how you like it! Have you ever made homemade egg rolls before? Skip the takeout and make homemade crunchy Airfryer or Ninja Foodi egg rolls today! Filled with pork and cabbage and air fried to perfection. Place Egg Roll Mixture in your wrapper.